Girl Kuripot Girl Kuripot: Win Tickets to John Legend's Concert in Manila! Win Tickets to John Legend's Concert in Manila! Share This on Twitter! This is a chance to win tickets to John Legend's concert in Manila! You have until September 22, 2014! 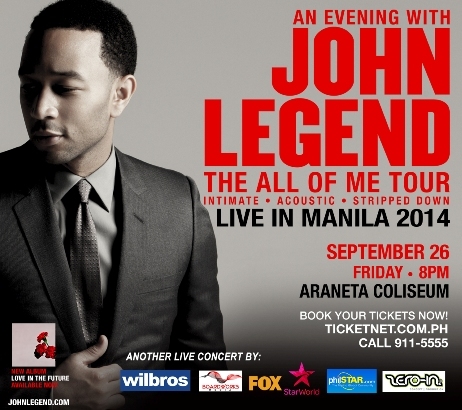 Click here for more info on the Philstar John Legend Manila Concert Giveaway. @CignalTV, Win a 3D2N Trip for 2 to Korea! Giveaway: Win P1K Crystal Jade GC! @StarCruisesAsia, Win a 7D6N Cruise Trip for 2! Win Tickets to Shane Filan's Concert in Manila! Win a Cebu Pacific Trip for 4 to Singapore! @KLM, Win a 5N Trip for 2 to Amsterdam! Join the Doodle 4 Google Philippines Contest! @TLC_SEAsia, Win a 5D4N Trip for 2 to Tokyo! 25th Philippine Travel Mart This Weekend! Win an Overnight Stay at @TheLakeHotel Tagaytay! @KFCPhilippines, Win 1 of 3 Instax Cameras!